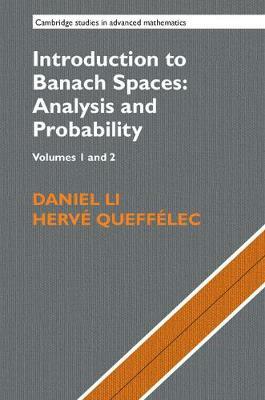 This two-volume text provides a complete overview of the theory of Banach spaces, emphasising its interplay with classical and harmonic analysis (particularly Sidon sets) and probability. The authors give a full exposition of all results, as well as numerous exercises and comments to complement the text and aid graduate students in functional analysis. The book will also be an invaluable reference volume for researchers in analysis. Volume 1 covers the basics of Banach space theory, operatory theory in Banach spaces, harmonic analysis and probability. The authors also provide an annex devoted to compact Abelian groups. Volume 2 focuses on applications of the tools presented in the first volume, including Dvoretzky's theorem, spaces without the approximation property, Gaussian processes, and more. In volume 2, four leading experts also provide surveys outlining major developments in the field since the publication of the original French edition.